If I gave you the acronym "WWF" what would you think it stood for? If I gave you the acronym "WWW" and you figured it out and the same first two letters were exactly the same as in the first example, what would your guess be then? So step back, let's think about this. We went from a world where static information on the Internet became dynamic information. It became sortable, sharable and down right convenient. The RSS phenomenon meant any content could become ubiquitous - accessible anytime, anywhere, by anyone... No credentials, no creating a profile, no establishment of yet another channel that had to be managed. This was Web 2.0. As you note from this post's title, I think Facebook missed that page in the Internet's history. Now I am completely sold on the value of Facebook as a tool to manage personal relationships, but where I find Facebook lacking is in its endeavour to become a B2C and B2B channel friendly resource. Again, try "fan"-ing a Fan page in Facebook and while you can read the front page, you are "blocked" from becoming an actual Fan or browsing through additional content. Now go to YouTube, Flickr, Twitter, Wikipedia and see if you have trouble accessing content... No? That is the entire point! Hello, McFly, Hello!!!! Why is that such a sensitive issue for us here at SideStreet? Well, again, Web 2.0 was a movement all about information access. Facebook has developed barriers. So just create a free profile, log in and there is no barrier you say? Well, in one direction yes, but Web 2.0 was about creating a flow of information that was multi-directional - left, right, up, down, northest, southwest, z-axis, etc. True social media should be portable. We believe this is a fundamental tenet from the era of Web 2.0, particularly when enabling businesses. So while, yes, I can get in to view Facebook content by joining Facebook, I can't view Facebook content outside of Facebook, and this is where our gripe truly lies. The posting or "wall" of Facebook is a perfect kernel of information to shoehorn into a business's web site or blog to get an "inside" look at what social dynamic is occuring. We can pull a Twitter feed, a YouTube channel feed, every blog has an RSS feed, even Flickr figured it out by adapting their slideshow technology to any browser window, but Facebook???? So I will end this long-winded whine (yes, I have the "whine" flu) with a plea to Facebook to get with the game. All it will do is shove the Facebook brand and the unique content in front of more eyes which will bring in more users which will bring in more revenue which will, at the end of Web 4.0, most likely displace the WWW with the WWF. Easy enough, nothing fancy, but, then, we developed a function called the SideNote. Y'know, a "Cliff Note" type of function to aggregate and pull summaries of basic info together. And then there was the SideTrack, which would lead to the SideNote and to the SideLink (hyperlink) and to the SideStop (gateway to nothing). Not to mention the SideBar, our rollover function. And all of a sudden we saw a trend going and so kept on going. 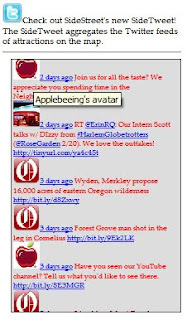 We introduced the SideView, a navigable thumbnail of the map and, most recently, possibly our coup de gras, the SideTweet (see the screenshot), an aggregation of all Twitter feeds associated with a map presented through a ticker-type presentation. So we all hate them, but here in the life of the startup I figure every chance I have to set some goals and actually achieve them is a good thing. And everyone loves a Top 10 list and in blending the two I figure not only will I make this more fun for you to read, but also more fun for me to write! 1) Invoice. It's amazing what cash in the bank can do for the corporate ego! 2) Invoice. Did I say that already? 3) Launch targeted PR & marketing within the vertical industries of some of our initial (and hopefully satisfied) clients. 4) Get Jason an iPhone. I'm pretty sure it kills Jason every time we get together and I wing out my mobile Mac platform and start buzzing away on it. 5) Get more clients (I'm pretty sure this will be a regular on this list every year). 6) Start an advisory board. 7) Develop an iPhone application (and if Jason doesn't have an iPhone by then I will really be in trouble). 8) Have a board meeting in some remote, exotic location at the expense of the taxpayers (oh, sorry, letting my cynicism get to me). 9) Leverage Brian's presence in the Bay area to strike a strategic relationship with a number of venture capitalists, Google and Yahoo. 10) Have fun and continue to never let go of the dream. Poke fun, have at it, but that is what my brain told my fingers to write and I'm sticking by whatever I just wrote (I promise to read them later).